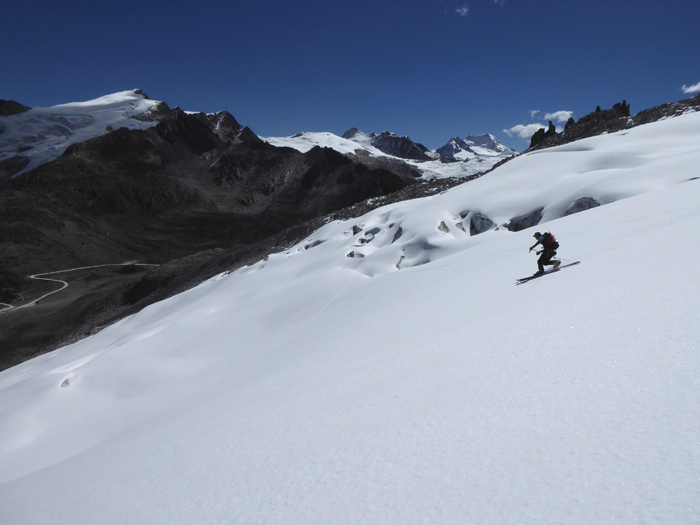 Exploratory Ski Mountaineering in Bolivia. Our 2018 expedition sold out. We will probably schedule this itinerary again for May 2020. This itinerary visits a country we know well to explore some of the highest mountains on skis. We aim to keep the itinerary fairly flexible to make the best use of snow conditions for ski-mountaineering, but plan to ski one high 5800m+ or 6000m peak after an initial phase of skiing several 5000-5500m peaks. The expedition will fly out to La Paz, the capital of Bolivia. Our first two days will be spent in this city and visiting nearby tourist attractions to acclimatise to the altitude. Then we'll spend a half day out at the world's highest 'ski resort' just outside the city. Called Chacaltaya, it is at 5100m and has only one old and broken rope tow, but a high road provides easy access to the snowline and if conditions are good we'll do a half day ski-tour. For out first big mountain trip we will ski several 5000m peaks around the Khara Khota valley in the central Cordillera Real. This first short mountain trip will be based in tents, with several nights camping and approaches to the mountains by 4x4 and/or on foot. The scenery in this high and remote valley is really superb and in the past we've had good snow conditions on the peaks. Finally, our main objective is to ski a high 5800m+ or even 6000m peak. This is very likely to be either the volcano, Volcan Parinacota 6342m (pictured a long way below) or a peak in the southern Cordillera Real called Mururata, 5869m (pictured on the left in the photo of La Paz below). The choice of big peak will depend on current snow conditions on the mountains, and a final decision will be made when we are out in Bolivia. Expedition members must be strong alpine skiers, able to ski black runs confidently and in full control. Previous touring experience and previous high altitude experience are also highly recommended (but neither is absolutely essential). However at least a little previous experience of using an ice-axe and crampons in a mountaineering setting is essential. 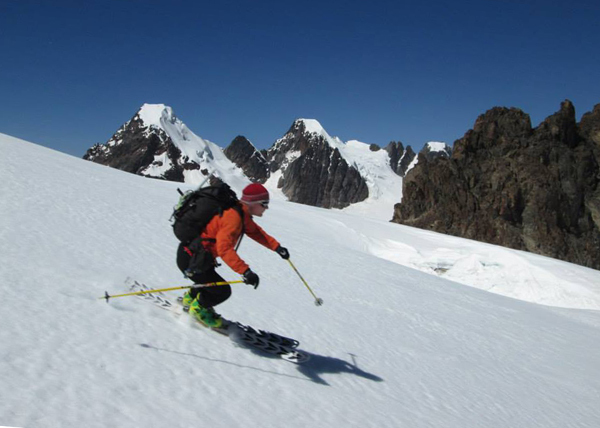 We will take our own skis out to Bolivia, you can bring either alpine or telemark kit, but given the terrain we plan to ski on we strongly recommend Alpine touring kit. 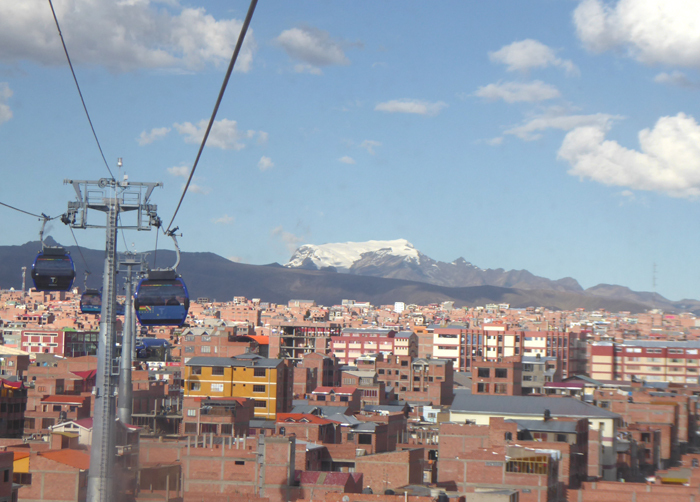 Mururata, 5868m from the public transport teleferico in the suburb of El Alto, La Paz. Day 1-2 Flight and day in La Paz. Day 3-4 Optional excursions to Lago Titicaca, Tiahuanaco. Day 5 Half day trip to Chacaltaya "resort" for acclimatisation. Ski exploration of the Khara Khota valley in the Cordillera Real. Day 11 Rest in La Paz. Day 12-14 Parinacota or Mururata ascent.... and descent! Day 15-16 Return to La Paz and return home. Skinning at 5300m on Jishka Pata in the Khara Khota valley. The peak on the left is another one we've skiied before, Janco Huyo, 5512m. La Paz is the capital of Bolivia and the world's highest capital city. The nearby mountains provide fresh air and the city has an agreeable climate. It gets warm in the sun during the day but, because of the altitude, quite cold every night. The main business district with its modern skyscrapers is set at about 3700m in the bottom of a canyon. The city stretches up and down the canyon from here; the rich live in the suburb of La Florida; the poorest people live on the steep sides of the canyon and in the district of El Alto at over 4100m above sea level. The ruins of Tiahuanaco make an interesting short day trip from La Paz which those who are interested can take during our first two days in the city. The ruins are from several different civilisations preceding the Incas; the site was first used almost three thousand years ago. Also possible is a full day tour to Lago Titicaca, famous as the world's highest navigable lake and certainly one of the most beautiful. The waters are clear and blue and there are fine views to the snow capped mountains of the northern Cordillera Real. You can take a short boat cruise on the lake to see some of the fishing boats and islands and have trout for lunch (this is almost unavoidable when you go to Lago Titicaca). If you are interested to do either of these optional tourist trips from La Paz please let us know and we'll make all the arrangements for you. The worlds highest ski 'resort' is the old rope tow and run-down cafe on the mountain called Chacaltaya just a few hours outside La Paz. If snow conditions permit we'll spend a few hours here refining our high altitude ski technique and also getting used to the Bolivian snow. If possible this will include the short ski to the summit of Chacaltaya mountain, 5395m. These days skiable snow is not guaranteed at Chacaltaya, in which case we'll do an acclimatisation hike to the top of the mountain. Skiing Culin Thojo in the Khara Khota valley. 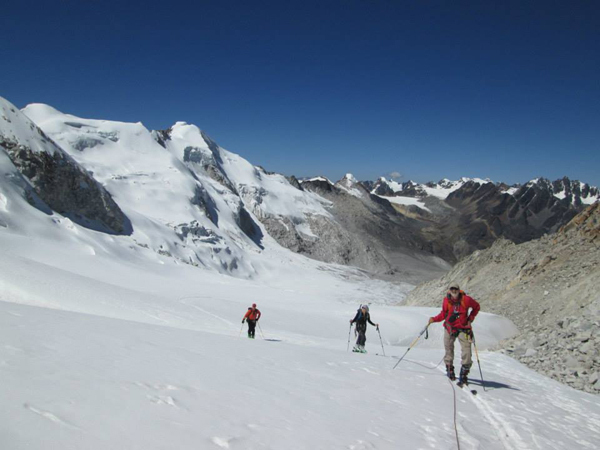 We have regularly visited the Khara Khota valley as an acclimatisation venue for our mountaineering trips to Bolivia and it makes a fine venue for a ski trip as well. The peaks are relatively near the roads, with just small glaciers, few if any crevasses and relatively "rolling" terrain. We may climb and ski several of the following peaks that surround the valley - Wila Llojeta 5244m, Janco Huyo 5512m, Jishka Pata 5508m. The exact choice will depend on where the best snow is lying and client fitness and acclimatisation. This part of the expedition is based in tents, approaching the mountains from a roadside base camp by either 4x4 or on foot. All the peaks involve at least a few hundred metres of ascent to reach the snowline. 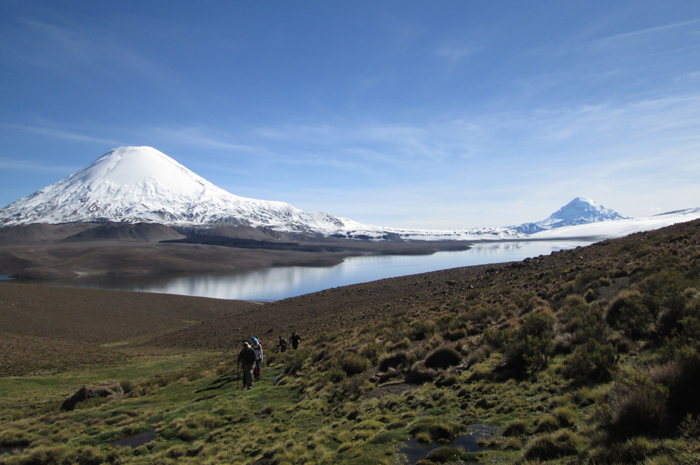 Parinacota volcano, pictured below, is a beautiful symmetrical cone, covered in pure white snow. It is the worlds highest volcanic cone and one of the worlds ten highest volcanoes. At 6342m it is also one of the highest peaks in this part of the Andes and the views from the summit out across the 'Altiplano' and down into the deep volcanic crater are superb. We'll climb the mountain by the south or east flank (depending on the best snow conditions), crossing on foot over an extensive lava desert of pumice to a high camp near the snowline at 5500m. From here we will climb to the summit and ski back down in one long day. Volcan Parinacota form the west after a fresh snowfall. Pictured below, Mururata, 5869m, is an alternative high peak that we may do if current conditions on Parinacota are not reported to be great. As it is a bit less steep it is more skiable when snow conditions in the mountains are questionable (either icy or high avalanche risk). We'll carry skis and camping kit to a high campsite at 4900m over two days, then have one or two days to ski the glacier and summit. The views of the steep north face of Illimani, and of the distant street lights of La Paz at night are very memorable. Skiing at 5000m on Wila Llojeta, Khara Kota valley Bolivia. This expedition is scheduled during the early part of the winter dry season in this part of the Andes and we can expect long periods of stable weather. However there can sometimes be windy days and light snow flurries. It is early winter in Bolivia; during the day it normally feels pleasantly warm in the strong sunshine, but at night temperatures at altitude go down to -10ºC during the 12 hours of darkness. Bring a warm sleeping bag and a good book! Clients should be very experienced skiers and mountaineers. At least a little previous mountaineering experience, using an ice-axe and crampons, is essential. Expedition members need to be reasonably fit as we will be climbing and skiing at high altitudes. 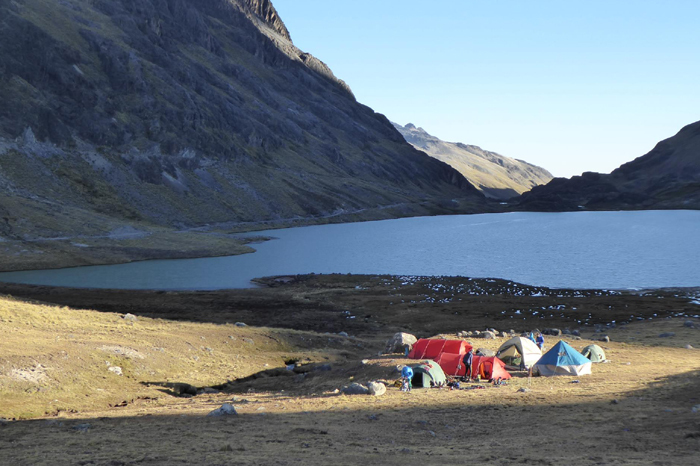 The ascent of Parinacota or Mururata in particular will place demands on your fitness - climbing above 6000m is always hard physical work and the summit day is likely to be over 10 hours long. However we should stress that you don't need to be an olympic athlete! Cold nights, cold washing water and some tinned and dried food are a few of the experiences which will have to be enjoyed or endured. Because this is a tropical ski trip it definitely won't be "ski-in, ski-out" and we'll have to carry skis from the roadheads to the snowline on almost all of our peaks. Where possible we will make use of a 4x4, horses or mules to help with this. All clients must be insured for medical costs and repatriation in an emergency. We recommend having insurance for baggage, personal liability and cancellation as well. If you would like advice on insurance please ask. Bolivia is one of the poorest countries in South America and it is a good idea to avoid tap water, unwashed fruit, ice and all seafood. Vaccinations for tetanus, typhoid, polio and hepatitis are needed! Malaria and yellow fever precautions are not necessary as we won't be visiting mosquito infested areas. Bolivia is a friendly and relatively safe country to visit but it is important to stay alert when in busy public areas and to guard your belongings carefully. Muggings and violent crime against tourists are rare. We issue further advice on security to all clients before departure. 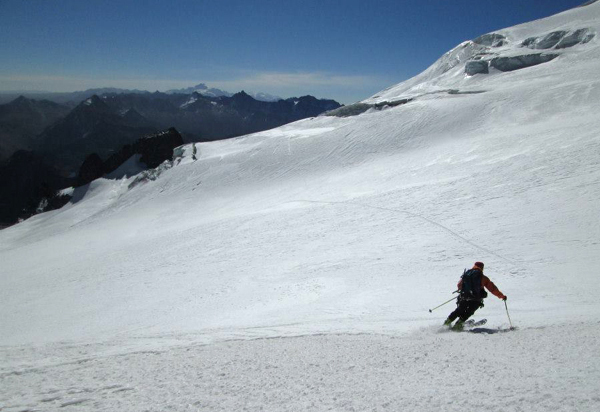 Skiing back down at 5400m on Mururata, 2014 Bolivian Ski Explorer expedition. This is an adventurous expedition and all clients will be exposed to an element of risk by taking part in this itinerary. While we take all reasonable precautions to reduce risk it is neither possible nor desirable to completely eliminate these additional risks. Some of these hazards carry the risk of serious injury or death. It is important that you understand the risks involved before signing our booking form. We have identified the following areas as the principal additional risks of this itinerary. This is not a fully inclusive list - please ask if you would like to see a more detailed risk assessment of this itinerary before booking. Driving, hotels and general safety : In Bolivia driving, health, fire safety standards and general safety standards are not as high nearly as in Europe. Crime : Bolivia has a higher crime rate than Europe. As a wealthy tourist you may attract attention. Remoteness : You will be more than a days walk/drive from professional medical help for periods of time throughout the expedition. There is almost no chance of a helicopter rescue. Mountain Hazards : In certain places you may be subjected to a slight risk of rock slips. During and after stormy weather there may be a risk of avalanche. There is also a risk from crevasse falls on some of the ascents, particularly Mururata. Our price does NOT INCLUDE - your flights, your insurance, your hotel/hostel accommodation, your meals taken at cafes and restaurants, your share of communal travel costs (e.g 4x4 rental, mule costs), your personal climbing, skiing and camping equipment (i.e. used by you alone, such as sleeping bag, harness, helmet), permits or peak fees payable by yourself. Scenic campsite in the Khara Khota valley, 2018 expedition.